The Cloth Hall is the centerpiece of the rebuilt city of Ypres. The former citizens of Ypres, displaced by the war, were not impressed with Churchill`s `sentiments: they wanted to go home. Their view prevailed. So they rebuilt the town where, at war’s end, for all intents and purposes not one brick had been left standing on top of another. Almost a century later I have mixed feelings about that. I understand the desire to return home, especially following such a bloody conflict. But I do have reservations about essentially recreating a 15th century town in the early 20th century. It looks very pretty, but was it practical? The money for the reconstruction came from the vanquished Germans, who under the terms of the Treaty of Versailles were required to pay about $33 billion (in gold) to the victorious Allies in reparations, a crippling sum that bankrupted their economy and set the stage for the next conflict. 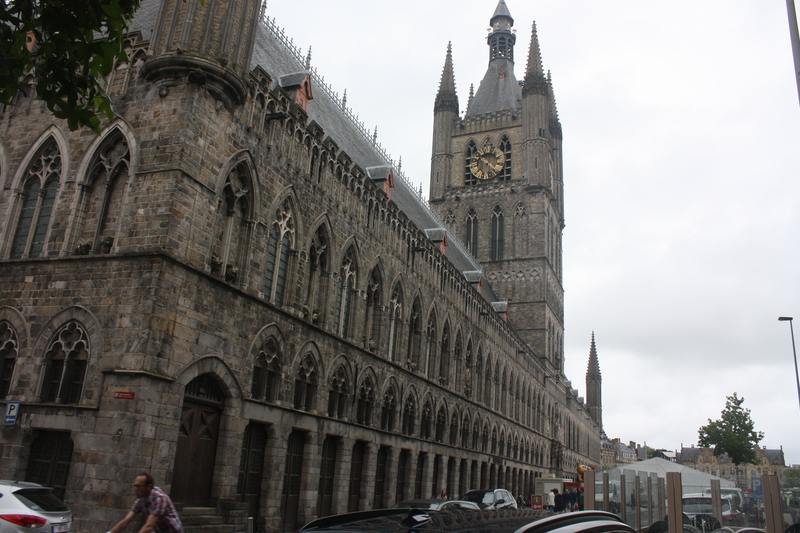 Ypres, rebuilt, is beautiful, and a tourist magnet. It looks just like it did before World War I, as the citizens recreated the town they loved. I would guess someone from the 15th century would recognize most of the buildings. I do question the wisdom though of building a 15th century town in the 20th century. The 12th century Cloth Hall that looks pretty much as it did 900 years ago (or at least as it did 150 years ago in the early years of photography). It’s a meeting place, houses the In Flanders Fields Museum and its parking lot hosts the local market as it has done for generations (though I didn’t see the livestock this year that I remember from 2009). What bothered me was one of the churches, probably St. James Church, even though the tourism website says it is only open for services. Maybe it was different five years ago. I had already been to St. Martin’s Cathedral, rebuilt exactly as it was before the war, but it was St, james I found disturbing. Like St. Martin’s, St. James church was beautiful. I`m sure it looked exactly like it did 500 years ago. A photo display in the narthex showed that it was almost 100 per cent new, though maybe a stone or two was left from the original building. And that got me to thinking. 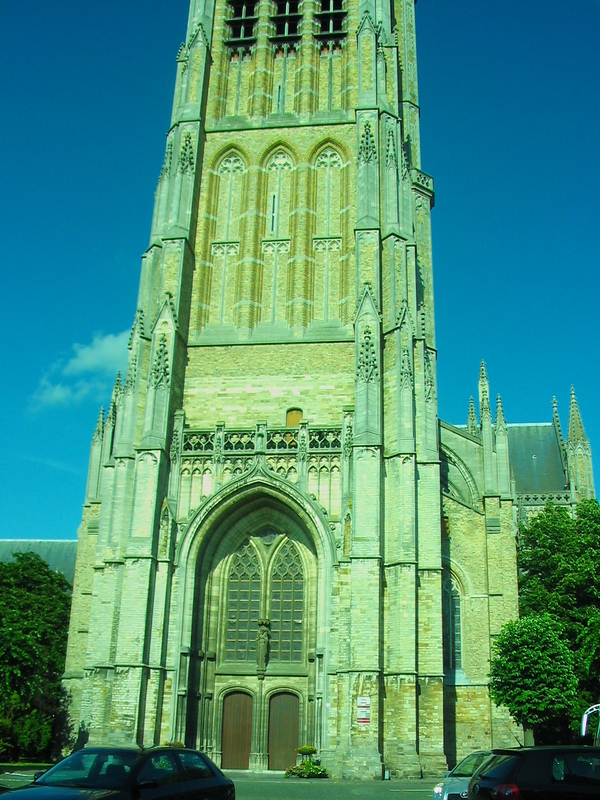 St. James Church in Ypres, looking much as it did hundreds of years ago. It was rebuilt after being destroyed during the First World War. For many years I attended a church constructed in 1893. Nice enough looking building, but not the best design for the needs of a congregation in the late 20th century. Times had changed, the people had changed, building codes had changed and there was only so much that could be done without major (very expensive) structural changes. So it seems to me that in many ways the people of Ypres missed an opportunity. I understand their desire to return to their homes, but why didn`t they modernize when they had the opportunity? Take for example the alms house. Actually, if my memory is correct there are at least two of them. Both have been converted to museums. By the 1920s I suspect society had changed and alms houses were out of vogue. I certainly don’t recall ever seeing or even hearing of one in North America – the concept seems positively Dickensian). Perhaps the space could have been put to more efficient use. It’s a thorny problem and I admit I have no answer. I respect tradition, I value heritage – but at what point do you just let things go, bury the past and move on? Any suggestions? If you use WordPress you don’t need to know code. I definitely really liked every bit of it and I have you bookmarked to check out new information on your web site. I grasp the idea that people should have started fresh…modernized and got on with life. For someone who wasn’t there before or immediately after the war it is easy to come to the conclusion. I have visited numerous times now and I think in its own way it is a fitting memorial for the destruction that took place in there until 1918 and once again under German occupation in 1940. In pondering your question I would ask that you do two things…first approach this from a position of a mourner….whose family and home has been utterly destroyed and if you read the accounts Ypres then is like Syria now…refugees fleeing. Secondly, in that same mindset understand that as you try to rationalize how it should be handled and done….war and its aftermath is irrational. Practicality doesn’t always win the day. And as a footnote, Hitler came through the area in 1940….visited the area of Messine…returned to the crypt of the church where his wounds were treated in 1917 and left the surrounding area and British Memorials intact under threat of punishment to his troops for their destruction. I know of no other spot besides the Western Front Area that was spared the destruction. Perhaps a modern Ypres would have been destroyed in 1940. Yet, the memory it held for the young corporal in the end spared it. Perhaps a wise decision afterall. Good points. I wonder though if recreating the past doesn’t cause someone to live in it. Hitler also spared the Vimy Memorial – which was not there in 1917, so it wasn’t just about memory for him. As you say, war and its aftermath are rarely rational. And maybe I am thinking too much like a North American. We have no old buildings so recreating them wouldn’t be a priority for us. Yes, of course it should have been rebuilt as it was outwardly. It is ignorant and facile to suggest that it is as it was in all respects. The buildings have new water pipes, not lead, there is electricity, gas, and broadband, it is not an impractical pastiche rebuild, it is an authentic outward reconstruction of the town with modern facilities inside. The best of both in fact, which should be obvious to all but the mentally regarded. I’ll assume your insulting tone is due to translation errors and let this stand. It remains a valid question. Canada is renovating its parliament buildings, which is costing billions of dollars more than it would have cost to build a new one. I stand by my comments, which were really more of a question.